The SPYs rose until late Wednesday when they clearly broke their uptrend. The SPYs dropped for the rest of the week. There were several gaps down and the market closed the week on a low point on heavy volume. This is a very bearish last few days to the trading week. The QQQQs formed a triangle consolidation (technically this is an ascending triangle because the bottom is, well, ascending) on Tuesday through Thursday. Note the 45.50 provided a great deal of resistance to the rally. Once the QQQQs broke through support they dropped hard. Notice the large gaps down and the fact the market ended near the low point for the week on heavy volume. This is also a very bearish chart. The IWMs formed a double top on Tuesday and Wednesday. Then they dropped hard for the rest of the week. Notice the gaps down and the fact the index closed near its weekly lows on heavy volume. The SPYs and QQQQs are still stuck in a trading range. But the IWMs have broken lower. The markets are closed so it's time to stop thinking about economics and the markets. 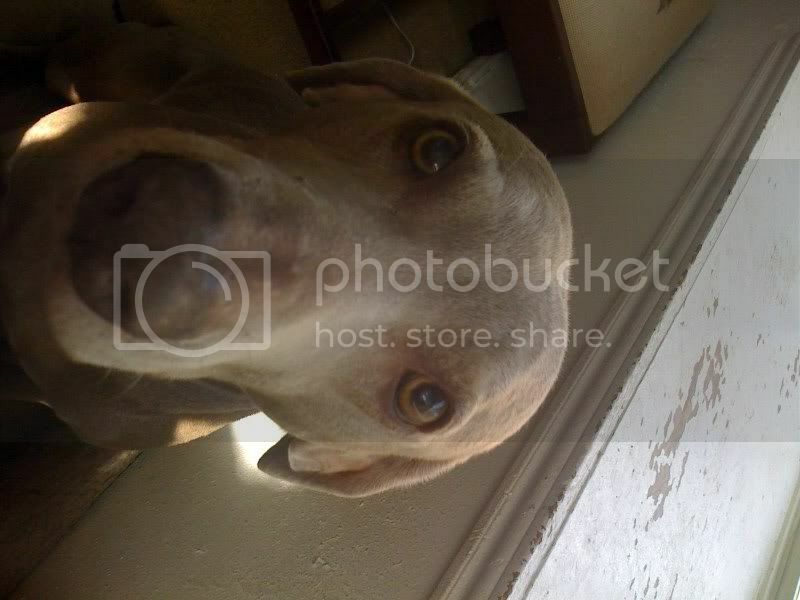 To help you get in the relaxing mood, here are some pictures of my dogs (the Weimeraners) and the future Mr$. Bonddad's dog -- the Beagle. Mish has been all over this story. Goldman Sachs economists estimate that as much as $3 trillion in mortgages could be underwater by the end of the year, leaving 30% of the country's outstanding mortgages in negative equity. Since there is roughly $1 trillion in subprime mortgages outstanding, that means a large amount of better-quality mortgages, such as prime and Alt-A -- a category between prime and subprime -- will be attached to negative equity. Sgt. First Class Nicklaus Skaggs is among those looking to walk way. 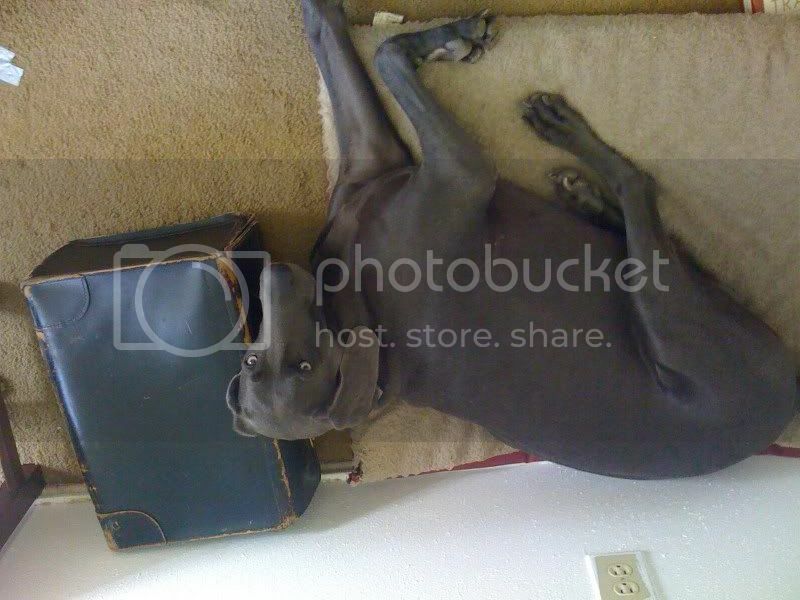 Mr. Skaggs bought his home in April 2005 shortly after returning to California from a one-year tour of duty in Baghdad. The $455,000 three-bedroom home he and his wife purchased in Vacaville, about one hour northeast of San Francisco, is worth an estimated $285,000 today, well below the $453,000 he owes on his mortgage. The monthly mortgage payment, which jumped after its interest rate increased, is now $4,000, up from $2,980 when he bought the house. Mr. Skaggs expects to be redeployed to Iraq again later this year. But he can't sell his home, since there are few buyers, and he can't refinance because lenders require a large down payment he doesn't have. Now, the 18-year Army veteran has decided to walk away from his mortgage. He hopes in a few years lenders see his decision as a unique situation created by the housing meltdown. "I don't think that house is going to recover in value any time soon," said the 40-year-old. "I'd just be throwing the money away." In the Phoenix area, where home prices were off 15% in the fourth-quarter when compared with a year ago, accountant Steven Ulrich says several of his clients have recently said they plan to walk away. One client's home is now worth $100,000 less than the mortgage and the other is $60,000 underwater. "It surprised me," said Mr. Ulrich, who works at The Focus Group in Scottsdale. "I'd never had people doing that before, if they had to it was something they were forced into. But these people are choosing it as a strategy, and I think it's going to be happening a lot more." First, this is entirely rational behavior. There is no point in paying more for something than it is worth. The bottom line is all the writedowns we've been hearing about are going to continue for the foreseeable future. 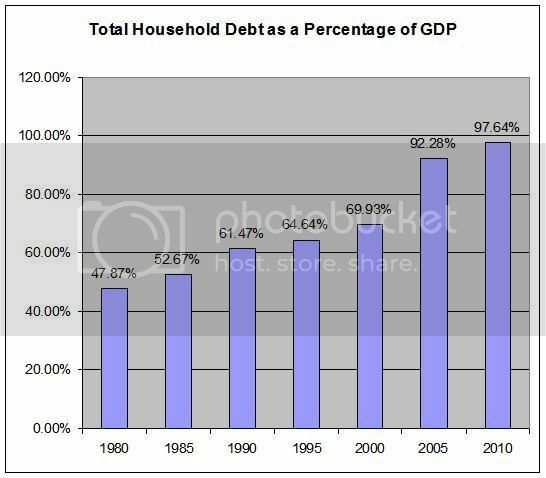 The writedowns first started because the debt wasn't worth nearly as much as people thought it was. Now we have a second problem: lenders who actually hold the underwater mortgages will be forced to devalue them in order to reflect current market condition. For all of 2007, insured institutions earned $105.5 billion, a decline of $39.8 billion (27.4 percent) from 2006. This is the lowest annual net income for the industry since 2002 and is the first time since 1999-2000 that annual net income has declined. While much of the decline in industry earnings was concentrated among some of the largest institutions, evidence of broader weakness in earnings bespoke an operating environment that was less favorable than in previous years. Net charge-offs registered a sharp increase in the fourth quarter, rising to $16.2 billion, compared to $8.5 billion in the fourth quarter of 2006. The annualized net charge-off rate in the fourth quarter was 0.83 percent, the highest since the fourth quarter of 2002. Net charge-offs were up year-over-year in all major loan categories except loans to the farm sector (agricultural production loans and real estate loans secured by farmland). Despite the heightened level of charge-offs, the rising trend in noncurrent loans that began in mid-2006 continued to gain momentum in the fourth quarter. Total noncurrent loans -- loans 90 days or more past due or in nonaccrual status -- rose by $26.9 billion (32.5 percent) in the last three months of 2007. This is the largest percentage increase in a single quarter in the 24 years for which noncurrent loan data are available. Insured institutions’ loss reserves posted their largest increase in 20 years in the fourth quarter, but this growth did not keep pace with the growth in noncurrent loans. Ladies and gentlemen, the quarterly banking profile indicates times are just starting to really hit the banks. But you ain't seen nothing yet. There is a fascinating story in today's WSJ today about the dollar. It mentions the current nosedive is causing a ton of problems for countries around the world. But it also mentions the dollar is very entrenched in global finance which means changing dominant currencies (to the euro, for example) would be extremely difficult. Beaten down by fears of a U.S. recession, the dollar is falling with new speed -- creating severe challenges not just for the U.S., but also for sugar traders in Brazil, central bankers in the Persian Gulf and a host of others. Yet for all of the gloom, the world is unready to let go of America's unloved dollar. Akin to the way Microsoft's often-criticized Windows operating system remains indispensable to the majority of computer users, the dollar remains the common language of finance, the medium of exchange in everything from sugar to wheat to oil. Shaking the dollar loose from that place would require a vast reworking of the global financial system that few parties seem prepared to confront. 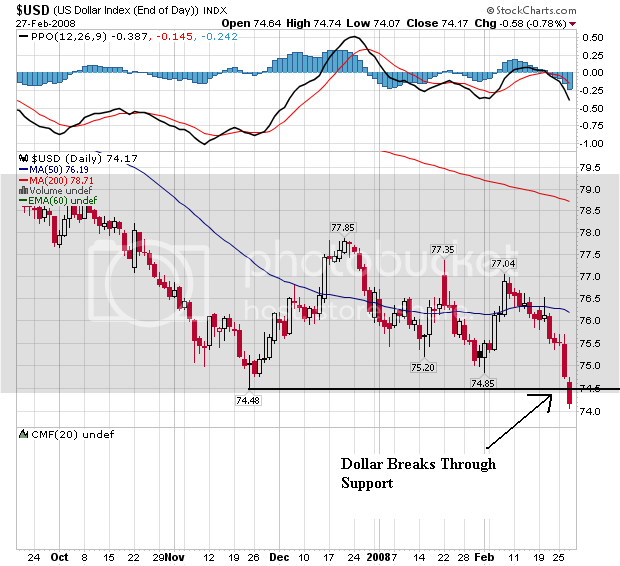 It is far from certain that the dollar will continue to decline. But if it does, businesses and policy makers around the world could be wrestling with the problems created by their dependence on it for many years. I love the Microsoft comparison -- that just makes me feel warm and fuzzy all over. But I think it is a very apt comparison. The whole article is a great read. Bernanke spoke to Congress on Wednesday. His opening statements provide a good outline of where the economy is presently. I have interspersed his comments with some news stories and various graphs to clarify Barnanke's points. I have separated his comments by indenting and italicizing them. Here is a link to his complete testimony. The economic situation has become distinctly less favorable since the time of our July report. Strains in financial markets, which first became evident late last summer, have persisted; and pressures on bank capital and the continued poor functioning of markets for securitized credit have led to tighter credit conditions for many households and businesses. The growth of real gross domestic product (GDP) held up well through the third quarter despite the financial turmoil, but it has since slowed sharply. Labor market conditions have similarly softened, as job creation has slowed and the unemployment rate--at 4.9 percent in January--has moved up somewhat. Record-high loan-loss provisions, record losses in trading activities and goodwill impairment expenses combined to dramatically reduce earnings at a number of FDIC-insured institutions in the fourth quarter of 2007. Fourth-quarter net income of $5.8 billion was the lowest amount reported by the industry since the fourth quarter of 1991, when earnings totaled $3.2 billion. It was $29.4 billion (83.5 percent) less than insured institutions earned in the fourth quarter of 2006. The average return on assets (ROA) in the quarter was 0.18 percent, down from 1.20 percent a year earlier. This is the lowest quarterly ROA since the fourth quarter of 1990, when it was a negative 0.19 percent. Insured institutions set aside a record $31.3 billion in provisions for loan losses in the fourth quarter, more than three times the $9.8 billion they set aside in the fourth quarter of 2006. The U.S. economy slowed sharply in the fourth quarter, growing at a 0.6% annual rate, unrevised from last month's estimate, the Commerce Department reported Thursday. For all of 2007, the economy grew at the weakest pace in five years, rising at an inflation-adjusted 2.2% after a 2.9% gain in 2006. The economy grew 4.9% in the third quarter. Year over year job growth has been dropping for about a year and a half and is now negative. Also note the unemployment rate is edging up. Many of the challenges now facing our economy stem from the continuing contraction of the U.S. housing market. In 2006, after a multiyear boom in residential construction and house prices, the housing market reversed course. Housing starts and sales of new homes are now less than half of their respective peaks, and house prices have flattened or declined in most areas. Changes in the availability of mortgage credit amplified the swings in the housing market. During the housing sector's expansion phase, increasingly lax lending standards, particularly in the subprime market, raised the effective demand for housing, pushing up prices and stimulating construction activity. As the housing market began to turn down, however, the slump in subprime mortgage originations, together with a more general tightening of credit conditions, has served to increase the severity of the downturn. Weaker house prices in turn have contributed to the deterioration in the performance of mortgage-related securities and reduced the availability of mortgage credit. New home sales have been dropping for awhile. I dealt with housing this week in this article. Consumer spending continued to increase at a solid pace through much of the second half of 2007, despite the problems in the housing market, but it appears to have slowed significantly toward the end of the year. The jump in the price of imported energy, which eroded real incomes and wages, likely contributed to the slowdown in spending, as did the declines in household wealth associated with the weakness in house prices and equity prices. Slowing job creation is yet another potential drag on household spending, as gains in payroll employment averaged little more than 40,000 per month during the three months ending in January, compared with an average increase of almost 100,000 per month over the previous three months. However, the recently enacted fiscal stimulus package should provide some support for household spending during the second half of this year and into next year. 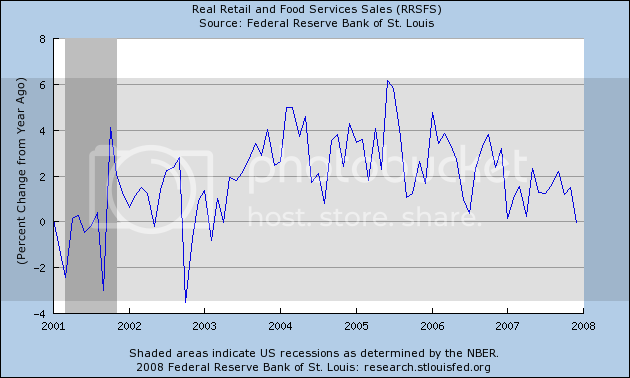 Real retail sales -- sales adjusted for inflation -0 are barely positive right now. Personal Consumption Expenditures aren't looking that hot either. The business sector has also displayed signs of being affected by the difficulties in the housing and credit markets. 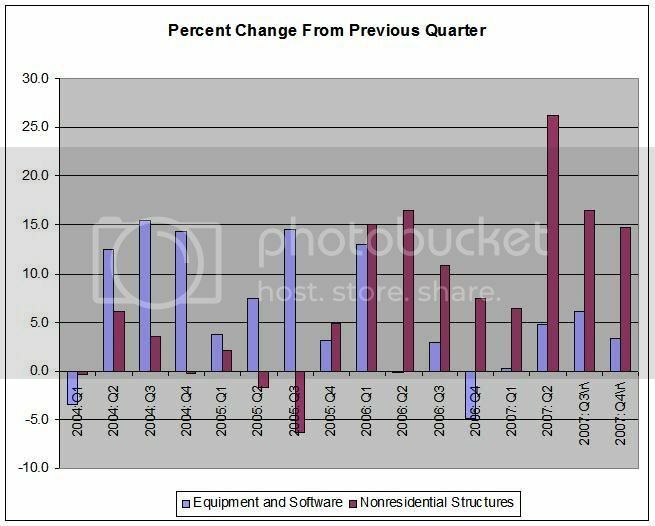 Reflecting a downshift in the growth of final demand and tighter credit conditions for some firms, available indicators suggest that investment in equipment and software will be subdued during the first half of 2008. Likewise, after growing robustly through much of 2007, nonresidential construction is likely to decelerate sharply in coming quarters as business activity slows and funding becomes harder to obtain, especially for more speculative projects. On a more encouraging note, we see few signs of any serious imbalances in business inventories aside from the overhang of unsold homes. And, as a whole, the nonfinancial business sector remains in good financial condition, with strong profits, liquid balance sheets, and corporate leverage near historical lows. Ben's right about business investment -- it's been pretty strong. But with the credit crunch, I have to wonder how long that can last. My guess is a lot of the growth we've seen over the last two quarters comes from deals that started before the credit markets fell apart. 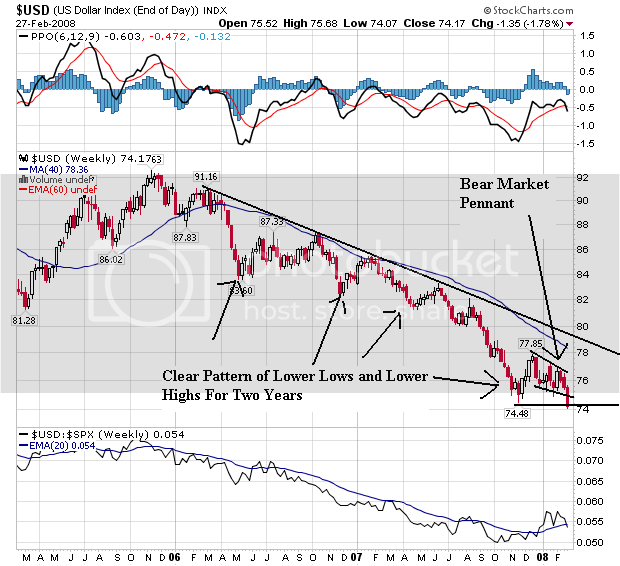 The next few quarters will be crucial to determining if the trend continues. Overall industrial production is doing fine. But you have to remember this figure includes all production such as utilities. The Philly and Empire State indexes tell a very different tale. They show a lot of pullback. And last months durable goods numbers weren't that good -- and durable goods orders have been negative from a year over year perspective for the last year. The only good picture in all of this is exports -- one of the few benefits of a crashing dollar. Bottom line: Ben has a lot of reasons to be concerned right now. Just when you thought it was safe to go back in into the market.....it returns. The dreaded trading range (cue dramatic B-movie horror music). The IWMs were easy to draw. The SPYs and QQQQs were a bit harder because there have been some moves outside of the range that lasted for a few days but then corrected. The lines I drew were eyeballed and there is the strong possibility of debate about where they actually are. But it's pretty obvious there is a floor somewhere around where the lines are. So -- what's it gonna take to make the markets? First, I don't think we're moving meaningfully higher anytime soon. Just look at the news we've had this week -- housing is still in the dumps, growth is weak, durable goods orders are down, inflation is making a most unwelcome comeback and the Fed is pretty down on the economy. These are not data points that get people calling their brokers saying, "buy now." Assuming the news continues in this vein -- as in bad -- don't expect a rally. The only good news was the Fed is ready to cut rates -- but that wasn't enough to spark a rally. In fact, I think the only thing keeping the market afloat right now is the Fed's continued action and further action. So -- what will send the market lower? I think the next leg down will be caused by weak earnings. Right now it looks like traders think the market is fairly priced given the underlying economic fundamentals. But if it looks like earnings are taking another hit expect the sell orders to increase. Yesterday we learned the Fannie and Freddie were having their investment cap increased. This will allow them to purchase more mortgages on the open market. Yesterday we also learned that Fannie reported a nasty loss in the fourth quarter of last year. Freddie Mac reported a loss of $2.45 billion for the fourth quarter amid a continuing surge in home-mortgage defaults. The government-sponsored mortgage investor also warned of a further jump in losses stemming from those defaults this year and next as more borrowers fall behind and home prices fall in much of the country. But Buddy Piszel, chief financial officer, said in an interview that Freddie doesn't expect to need to raise capital again this year unless conditions get "dramatically worse." The company raised $6 billion late last year through a sale of preferred stock. So of course -- let's expand their ability to take on bad loans. Bottom line -- Freddie and Fannie are quasi-public entities. If they have deepening problems they will eventually come to the US Congress for money -- which Congress will be forced to give for purely political reasons. Don't be surprised if that eventually happens. Mr. Paulson, a former chief executive of Goldman Sachs Group, repeated his view that the U.S. economy is fundamentally on sound footing and would dodge a recession. [Look out the window. My God, why it's a....a......a...... pig flying by with large golden wings!] Still, he warned again yesterday that the chances of worse-than-expected economic growth are greater than the chances of an upside surprise. Part of the reason for this statement/publicly stated belief is Paulson needs to show strength for the cameras. I get that. But at some point honesty becomes a better policy in my opinion. Barry at the Big Picture addresses the same issue here. It is well worth the read. 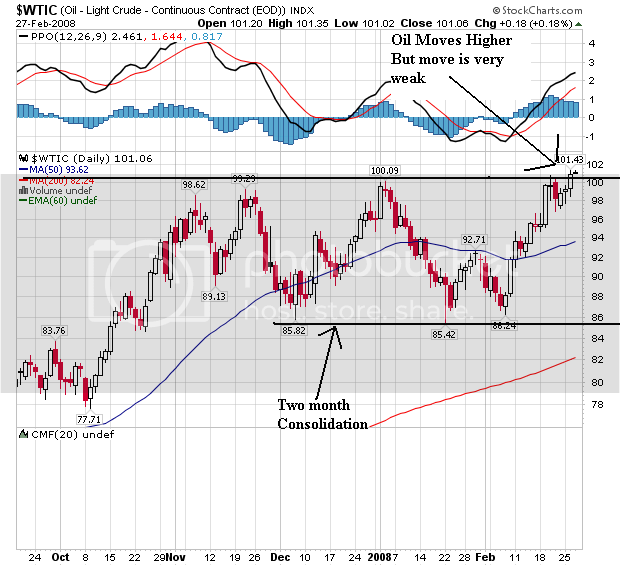 The Fed, the Dollar, the Euro and Oil ... Oh My! As the chart above clearly shows, the dollar has been dropping for the better part of the last two years. There are a lot of reasons for this. The mammoth US trade deficit (which is getting a bit better) and the large amount of US debt held by foreigners are prime reasons. However, since the Fed started cutting rates aggressively, the dollar has continued to drop. The dollar traded at a record low below $1.51 per euro after Federal Reserve Chairman Ben S. Bernanke signaled he's ready to lower interest rates again to support the weakening U.S. economy. An index that tracks the currency against six major counterparts dropped yesterday to the lowest since its inception in 1973, as European Central Bank policy maker Axel Weber said investors expecting rate cuts in the region are underestimating inflation. The U.S. currency fell to an all-time low against the Swiss franc and to a 23-year low versus the Australian dollar. LaScala said dollar-selling gained momentum on Feb. 26 after Fed Vice Chairman Donald Kohn said turmoil in credit markets and the possibility of a slower economy pose a ``greater threat'' than inflation. The currency has slid 4 percent against the euro in the past three weeks as the housing recession worsened and consumer confidence sank, leading traders to exit bets on a dollar rebound. The dollar will rise to $1.45 per euro by mid-year, according to the median forecast in a Bloomberg survey. 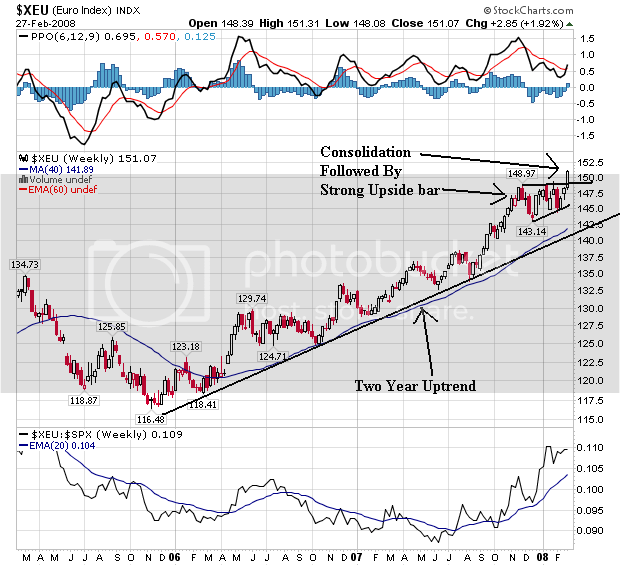 As the dollar has dropped, the euro has benefited. Notice how the euro and the dollar chart for the last two years are near mirror images of one another. And notice how the euro dollar mirror image relationship plays out in the daily chart above. Now let's add one more piece to the puzzle -- oil. Crude-oil futures fell more than $1 to end below $100 a barrel on Wednesday, after hitting a record high above $102 overnight, as government data showed a bigger-than-expected buildup in U.S. crude inventories. Crude oil for April delivery dropped $1.24, or 1.2%, to settle at $99.64 a barrel on the New York Mercantile Exchange. It surged to an all-time high of $102.08 in electronic trading over night, driven up by the weaker dollar. Notice the clear long-term rally in place for the last year. 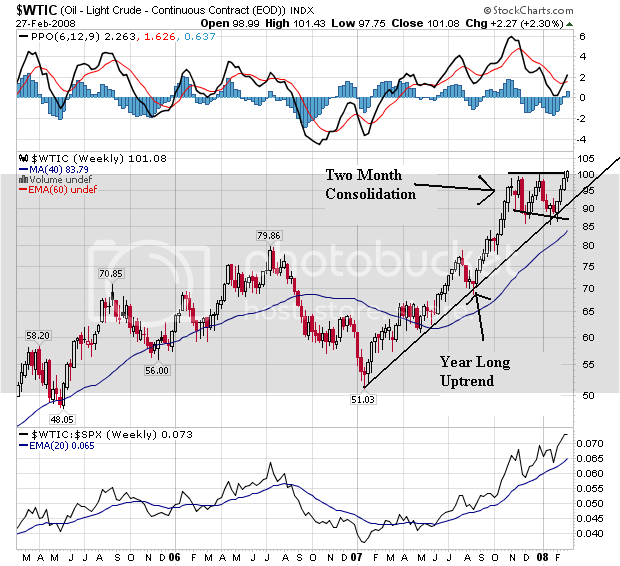 On the daily chart, notice the trading/consolidation range for the last few months and the recent break-out. However, also notice the break-out isn't that strong. So -- let's look at the following chain of events. 1.) The Fed is lowering interest rates and has signaled they will continue to lower rates. 2.) This entices forex traders to sell the dollar. 3.) A dropping dollar encourages oil traders to buy oil as an inflation hedge from the dropping dollar. 4.) A dropping dollar is also a de facto decrease in the value of oil -- which it so happens is priced in dollars. This puts a price floor under oil's price. 5.) As oil prices increase, inflation increases. 6.) As the dollar drops, forex traders look to a stable currency which is the euro (at least for now). So as the Fed lowers interest rates, they are in fact stoking energy inflation and encouraging the migration away from the dollar. The markets treaded water today. That means the rally started over the last two days could still be intact. Let's take a look at the charts. -- The trading range is pretty clear and the current price action is above the range. 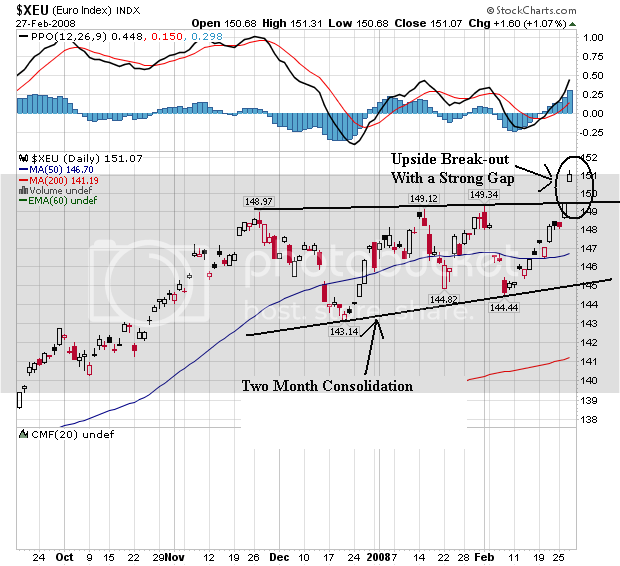 -- The index could be forming a double top or broadening formation. Both are considered reversal formations. Considering that Bernanke said he would lower rates again, this reaction is pretty weak. The 10-day QQQQ chart shows the clear trading range this index is in. However, the 4-day chart shows an uptrend in place, albeit is weak one. But, it is there. The IWMs have run into strong resistance right around 72 and may have formed a double top as well. Yesterday, the SPYs broke out of their range with a strong move upward. Today they consolidated that move, but not other index followed higher. If the indexes wanted to move higher, today would have been the day with the Fed's talk of more easing. In case you were wondering who would pay for the housing mess -- it's you and me. Not that there was any doubt about that in the end, but it sure was nice to think that maybe the people who got us into this mess -- the mortgage brokers who didn't perform any credit checks, the banks who didn't look at the collateral they were buying, the investment banks who didn't look at the collateral and the ratings agencies who gave everything a giant thumbs up -- would bear some responsibility. Fannie's $3.56 billion quarterly loss contrasts with a profit of $604 million in the same period a year earlier. The loss was equivalent to $3.80 a share, and compared with a profit of 49 cents a share a year earlier. Thomson Financial said Wall Street analysts had expected the company to lose $1.24 a share in the latest period. "We are working through the toughest housing and mortgage markets in a generation," the company's president and CEO, Daniel Mudd, said in a statement. He said the company's losses reflected "the significant decline in home prices in a number of large regional markets and the growing number of borrowers struggling with their mortgages." Mudd called 2008 "another tough year." They lost a ton of money. So -- here's a great idea -- let's let them increase the amount of risk they can take on! The regulator for mortgage-finance giants Fannie Mae and Freddie Mac said Wednesday it would lift a cap on the two companies' investment portfolios on March 1. The announcement from the Office of Federal Housing Enterprise Oversight came just hours after Fannie Mae was able to successfully file its 2007 financial statements on time Wednesday morning. Freddie Mac is expected to report its full-year 2007 results Thursday. Shares of both Fannie and Freddie surged on the news. In late morning trading, Fannie shares were up $3.14, or 12%, to $30.11, while Freddie was up $2.14, or 8.5%, to $27.35, both on the New York Stock Exchange. The inability of both firms to file their audited financial statements in a timely fashion was one of the major reasons Ofheo had placed a cap on the companies' retained mortgage portfolios. Now that Fannie Mae and Freddie Mac are able to successfully file on time, the caps are no longer necessary, Ofheo Director James Lockhart said in a statement. Ladies and gentlemen -- the financial markets are frozen right now and for a damn good reason. Over the last 7 years -- and especially over the last 3 years or so -- a ton of bad loans were made. They were dressed up in complicated structures that were supposed to mitigate risk, but that didn't work. As a result every major financial player -- every bank, insurance company, brokerage firm etc.. -- has come out and said "we have a ton of bad loans on our books that aren't worth as much as we thought." This means there is a strong fear of default, meaning every lender on the planet is concerned that every borrower is in a fact a default risk. That's why the credit markets have frozen. And they should be frozen right now. That's the price you pay when you let really stupid policies run rampant in the economy. But now the government is going to let two quasi-public institutions -- both of whom are having financial problems -- start buying more loans. Brilliant. And when it becomes obvious that Freddie and Fannie are losing more money, guess who will provide the bail-out? You and me. The S&P/Case-Shiller national home-price index for the fourth quarter fell 8.9% from a year earlier, the largest drop in its 20 years of data. And the Office of Federal Housing Enterprise Oversight's index -- which tracks only homes purchased with mortgages guaranteed by home-loan giants Fannie Mae or Freddie Mac -- was down 0.3%, the first year-to-year decline in the measure's 16 years. Prices aren't just correcting -- they're plummeting hard right now. -- Prices barely increased for the first half of the 1990s expansion. They did increase by 25% over the last three years of the expansion. -- Prices continued to increase during the slow growth of the early 2000s. 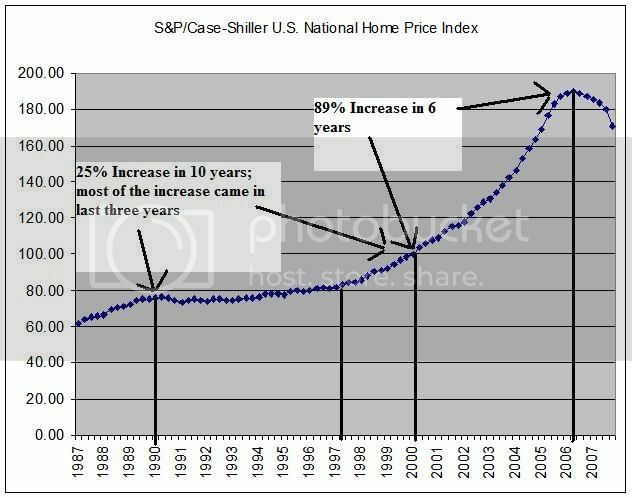 -- Prices exploded higher from 2003 onward. Notice the difference between the two expansions. The 1990s and 2000s both saw economic growth. Yet home prices really accelerated in the 2000s for a variety of reasons. Let's ask an important demand side question: was there a big difference from a demographic perspective between the 1990s and 2000? Did the US population explode higher? Did the US accept a whole lot more immigrants? The answer to both is no. What the chart shows is prices rose far above their historical norm. That means we have a long way to go before prices correct to their historical norm. And it's important to remember a basic economic fact at this point: prices have a strong tendency to revert to their mean/median historical price. 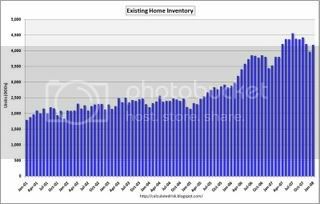 The total number of existing homes available for sale has nearly doubled since 2001. 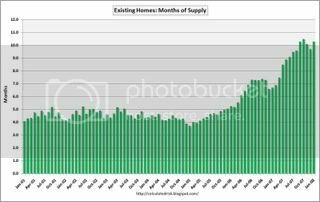 There is simply no way that US demand for housing also doubled in the last 8 years. As a result, we have a ton of inventory to work off. 1.) House prices are historically out of whack in a big way. They are far too high and need to come down. 2.) There is a boatload of inventory on the market. 3.) The sales pace is slowing. 4.) 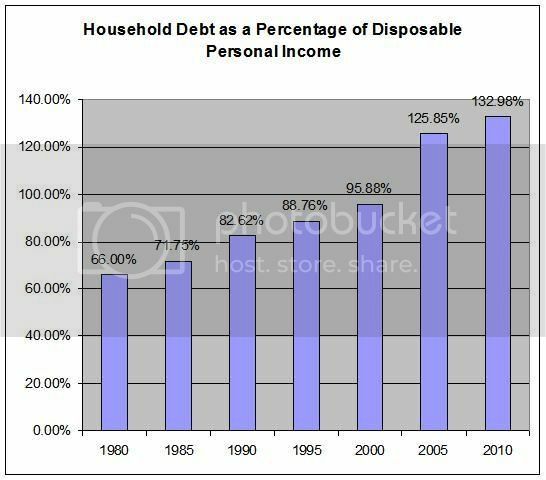 The US consumer is already in debt up to his eyeballs, indicating his ability to take out more mortgage debt is severely compromised. Here are some charts from the FDIC's Quarterly Banking Survey. OMG -- did the markets break out of their trading range today? Above is a 10 day chart of the SPYs in 5-minute increments. Notice the strong rally over the last 2 days from 133.15 (approximately) to 138.34 -- an increase of about 4%. That's a big move, although the back and forth action of the last 10 days has muted its importance. On the three day chart, notice the following. -- Yesterday's rally started with a gap up. This is very positive. -- There are three distinct higher high and higher low areas on since yesterday. -- The market has been able to hold onto its gains for two days in a row. These are all positive developments and may indicate the SPYs are moving higher. On the daily chart, notice the SPYs have clearly broken out. The question is can they maintain their momentum? However, the QQQQs are still trading in a range. Thee IWMs are at the top of their trading range. -- The index has been able to hold onto its gains two days in a row. -- At the end of trading today, notice the gap down. This would be considered a bearish move, but the index didn't crash. I'm wondering if the upward momentum from the SPYs continues, will it bleed through to the IWMs? Is the Treasury Rally Over?